In large bowl, beat frosting at medium speed, gradually adding 3 oz. 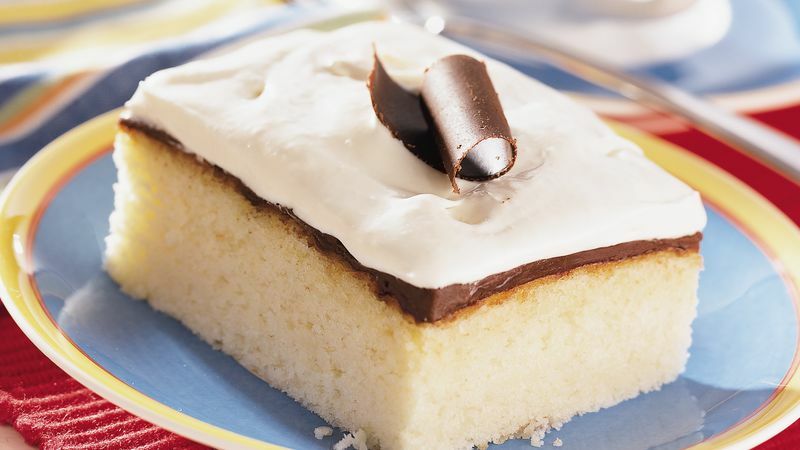 melted white chocolate baking bar. Beat at high speed 30 seconds or until smooth and well blended. Fold in 1 teaspoon vanilla and whipped topping. Refrigerate. Heat oven to 350°F. Grease and flour 13x9-inch pan. In large bowl, combine all cake ingredients except white chocolate baking bar; beat at low speed until moistened. Beat 2 minutes at medium speed. Gradually beat in 3 oz. melted white chocolate baking bar until well blended. Pour batter into greased and floured pan. Bake at 350°F. for 25 to 35 minutes or until toothpick inserted in center comes out clean. Cool 10 minutes. In small saucepan, combine chocolate chips and margarine; heat over low heat until melted. Stir in corn syrup and powdered sugar until well blended. Spread fudge filling over warm cake. Cool 1 hour or until completely cooled. Spread cake with frosting. Garnish with chocolate curls. Store in refrigerator. Let stand at room temperature for 10 minutes before serving.